Services are held at the Barn Church. These include informal communion at Christmas and Easter and an occasional Messy Church service for children. 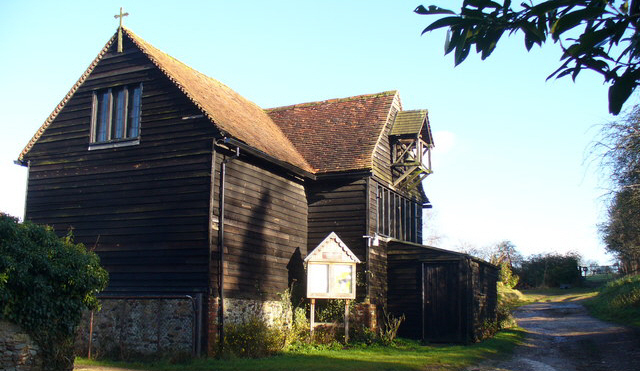 St Michael's Church is a converted 19th century barn, which replaced an earlier building, one of several in a yard farmed in 1839 from Brook Farm. It was built between 1840 and 1880, by which time the whole of the original yard had been rebuilt. Four years later the Albury Estate did further rebuilding and it was farmed as a complete unit, Cherryman's Farm, with 80 acres of land until it was sold in 1922, thereafter the land and buildings were let. The owner, Mr. Courtenay-Wells died in 1929 and the barn was given by his widow, Clara, to be converted into a church as a memorial to her husband at the expense of the Parochial Church Council for a Chapel of Ease in the Parish of Albury. It was dedicated in 1930. The work was carried out by F.W. Woods and Son, builders of Little London. The construction is a brick and ironstone dwarf wall, surmounted by oak framing with weatherboarding outside and lath and plaster inside. 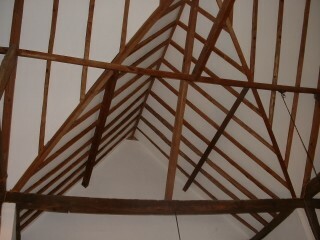 The roof is of strutted framework boarded on rafters and tiled. No architect was employed, the work being done under the supervision of Mr. Charles Allen of Yew Tree Cottage, Farley Green. The oak furniture and fittings in the chancel were made by Mr. Charles Allen and given by local people. Furniture in the sanctuary was given in memory of Lucy Allen (1870 - 1952), a devout and constant worshipper at the church. On the south wall of the chancel is a tablet "In memory of Clara Courtenay-Wells (1845 - 1948), who gave so much loving care to St. Michael's Church and unselfish service to Farley Green and the neighbourhood". There is a stone font and an organ, rebuilt by Kingate, Davison and Co. of London, in 1949. During the 1939 - 1945 war, when church bells were only to be rung in the event of an invasion, the single bell at St. Michael's was heard tolling. Upon investigation, it was found that a cow had broken out of the adjoining field and caught her horn in the bell rope! Also at that period, the church was occasionally used as a centre for A.R.P. instruction. The bell has recently been replaced as the original one was stolen. A local artist, Ernest Board, who lived at Thatch Cottage, Farley Green painted the panel on the reredos and designed the stained glass window depicting St. Christopher set in the north wall. It was made by the Skinner Board Co. of Bristol and is a memorial to Ernest Board (1877 - 1935). He was born at Worcester and was educated in Bristol. 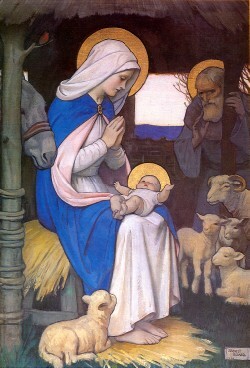 He Studied art at the Royal College of Art, at the Royal Academy Schools, and later in the studio of Edwin Austin Abbey. He exhibited at the Royal Academy from 1902. Board was a member of the Royal Institute of Oil Painters and the Royal West of England Academy. In 1983, the possible closure of St. Michael's was discussed. The continuance of the church became a very important issue and a group called The Friends of St Michael was founded. Like Clara Courtenay-Wells, they give much loving care and unselfish service to the Farley Green Barn Church. The Friends have recently had a kitchen and toilet installed and replaced many of the external boards. They have also bought new chairs.